Have you ever read a book that you wish you had written? This happens to me occasionally, but never like this. The Book Thief is a novel that I wish I had the talent and inspiration to write, and its depth, creativity, and beauty will stay with you for quite some time. A happy coincidence led me to Zusak’s novel in the first place. The high school where I teach builds in 15 minutes a day solely for students to read (a brilliant idea, and one that I shared with author Jonathan Franzen at his lecture/book signing, who was very impressed – so for future reference, when you are hobnobbing with best-selling authors, this is a good topic of conversation). A fellow teacher and friend loaned me her copy of the book, complete with coffee stains, a well-worn cover, and a note that said the book had been read and enjoyed by many people. I picked it up to read during the sustained, silent reading time each day, and I was absolutely captivated. 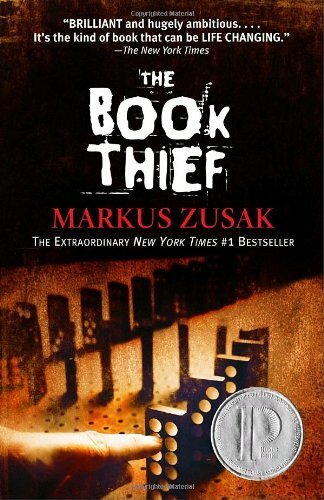 The novel takes place in Nazi Germany, the book thief is a young girl named Liesel Meminger, and the narrator is Death. The story is devastating and gorgeously-composed. And the brilliance of the writing will just crush you, believe me. Zusak drops clues and hints along the way that reach backwards and forwards, and the book almost functions as a highly satisfying puzzle. The textual inter-connectivity is just stunning, and the novel would certainly lend itself to extremely rewarding re-readings. The most excellent thing about this work, however, is that it is art come alive as literature. The entire novel is full of metaphoric and symbolic genius, and the word pictures are as original and unique as they are achingly memorable. Just a few examples: Liesel witnesses a Jewish prisoner with eyes “the color of agony.” After a bomb explores, “the roll call of names limped through the ruptured streets, sometimes ending with an ash-filled embrace or a knelt-down howl of grief. They accumulated, hour by hour, like sweet and sour dreams, waiting to happen.” Along with personification, Zusak is an expert at foreshadowing, both subtly and overtly: on Hitler’s birthday, “speeches would be made. A fire would be lit. A book would be stolen.” The thrill of the reading experience is following these breadcrumbs and watching in awe how they manifest into a cohesive, ingenious story. While working overtime during the Holocaust, Death carries souls in his arms, and the colors of the sky reflect the deceased’s nature (color is of the highest importance in the novel). Death himself is grimly humorous (he marvels at the chance happenings that take a person’s life: “it kills me sometimes, how people die”), but he is also solemn, burdened, and philosophical. In order to carry out his task, he must “try to remember the strewn pieces of beauty I saw in that time as well. I plow through my library of stories. In fact, I reach for one now,” and we readers are treated to these inspired tales. Aside from the stunning art of language and narrative, the actual artwork itself deserves a mention – illustrations throughout the text are beautifully done and play a large role in the story itself. Zusak also develops character masterfully, and Liesel subtly matures and changes throughout the novel almost to the point of perfection. The maturation in her voice and person could truly serve as an expert study in character development in a creative writing class. There are fantastic touches of humor and lightness, even though I realize the subject matter is fairly heavy. Certain moments of humanity at its finest are so uplifting and well-done that the entire reading experience is immensely rewarding. Admittedly, I was a little surprised, albeit pleased, that this was categorized in the young adult section – kids need to be reading literature like this instead of that supernatural, vampire crap. Even though I definitely think it skews toward readers a bit older, it would be a great conversation starter with students or kids in about every way you could imagine. The main point: grab a box of tissues, a sweater for your goose bump chills, and a friend to share this one with. By far, The Book Thief is one of the most creative, inspired, devastating, and brilliantly written books I’ve ever read.